Can’t you smell them now! Scald the milk in a small sauce pan and then add the sugar and the butter and let cool for a little while. Meanwhile dissolve the yeast in the warm water until completely dissolved. Don’t have the water too hot or it will kill the yeast, too cool and it won’t dissolve. I just use hot tap water. Place the milk mixture in a large mixing bowl when it has cooled. Add the salt and the beaten eggs. Then add the yeast mixture. Next start adding the flour. Only add 2 c. to begin with and mix well, then add one c. at a time until it is hard to mix with a spoon and not too dry. You want it to be a little sticky. 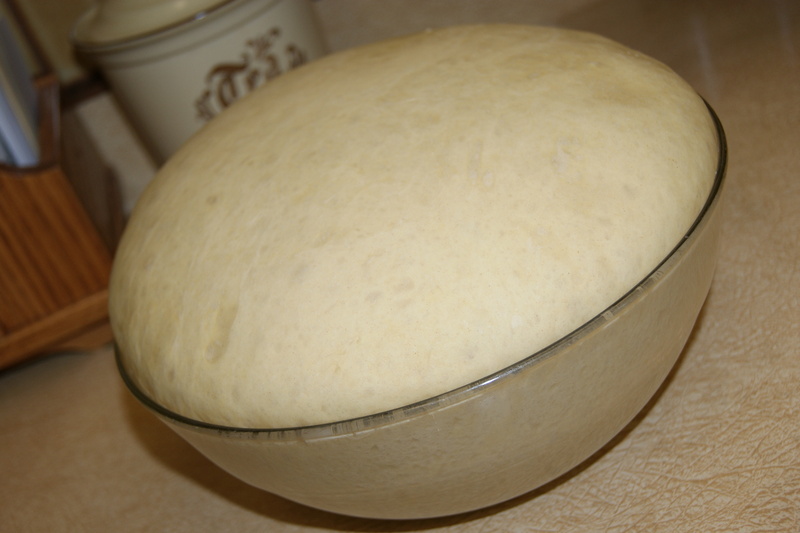 Then dump onto floured countertop and knead it for about 5-10 minutes until it is pretty smooth. Then place it in a buttered bowl, fairly large, so it can raise. Place it in a warm, draft-free spot to raise. This will take about 1-2 hours depending on the area it is raising in. 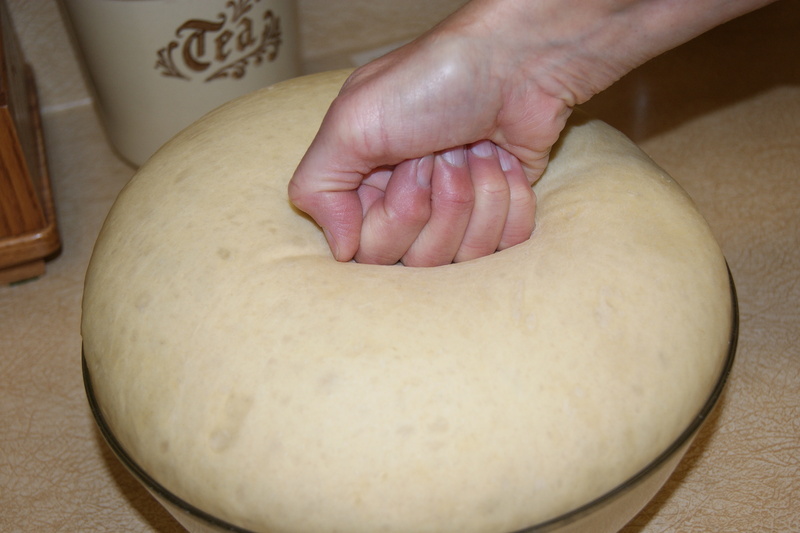 When it is doubled in size, punch ~~POW~~ the dough. Then make each roll into whatever design you want to. 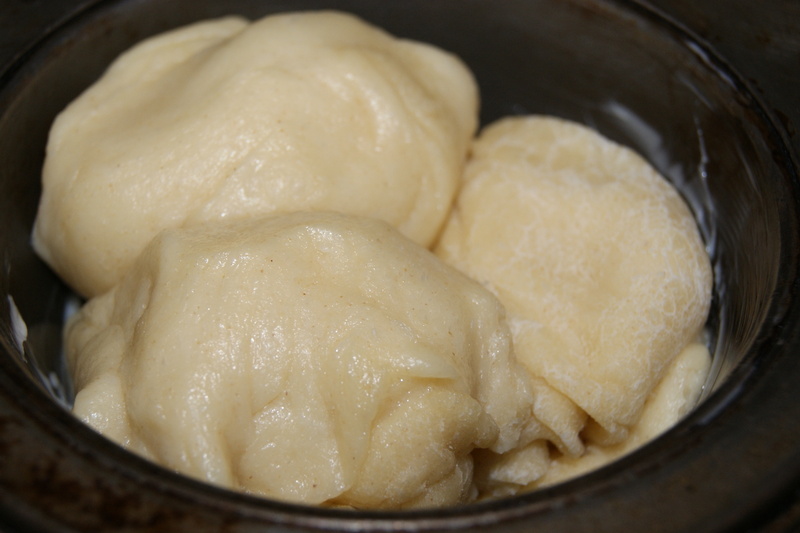 I usually make cloverleaf rolls which is where I take enough dough for one roll and divide it into 3 small balls and place each one in a muffin pan. 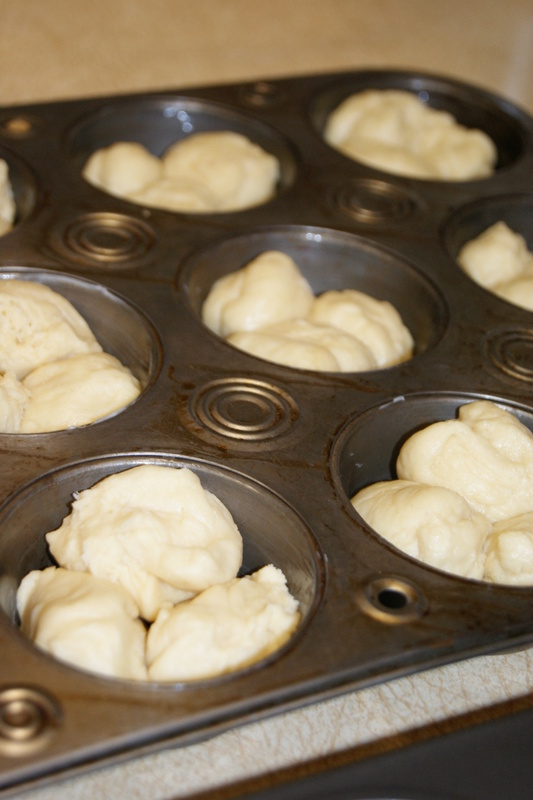 You can also make them in 2 13×9 pans too, I just like the individual rolls. Now, you need to let them raise again until rolls are just about doubled in size, this rising will be faster than the first one, about 30-45 minutes. 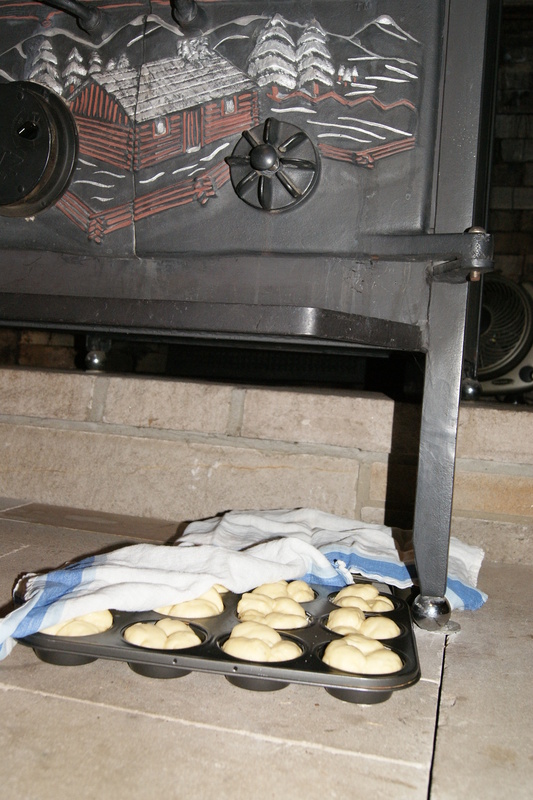 Cover the rolls with a very light weight towel so they don’t dry out while raising. You can also brush them with melted butter before baking too. Bake them at 350 for about 10-12 minutes until golden brown. When they come out of the oven brush with melted butter. Don’t they look warm and delicious! 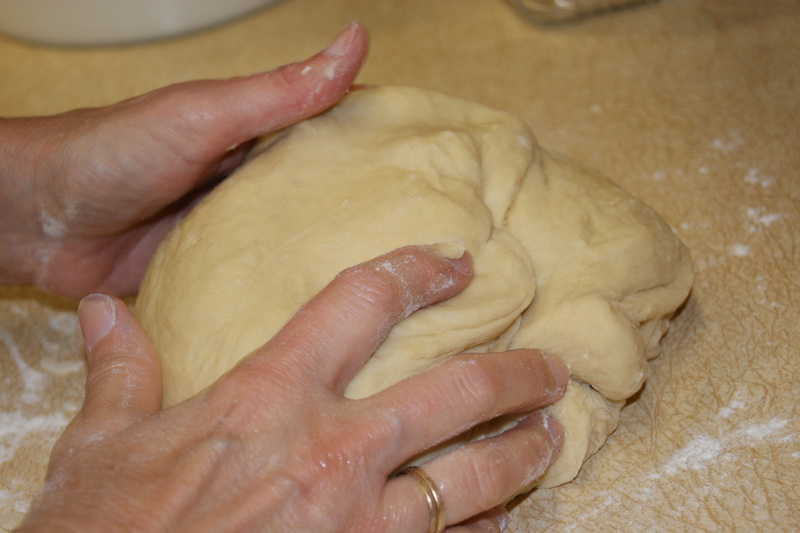 Have you ever made any homemade rolls? 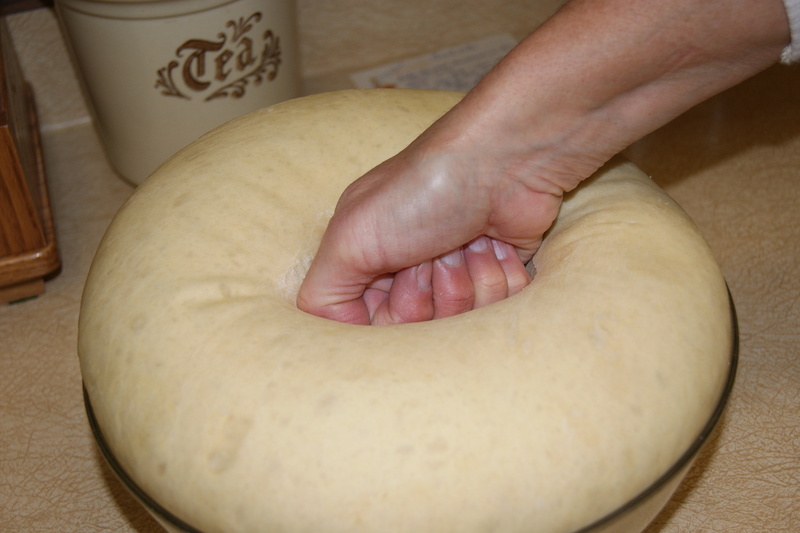 What is your favorite homemade roll recipe? This entry was posted in Deliciousness and tagged Bread, Butter, Dough, Flour, homemade roll, Yeast. Bookmark the permalink. Yum! I have never made homemade rolls or bread; I a domestically challenged slightly 🙂 It is on my to do list for this Spring or Summer whenever work isn’t so busy. I can image these would be perfect with butter! I am going to have to make these this weekend! Can’t wait! Yum, I love homemade bread and rolls. Yes, bread and butter are a favorite of mine! I need to get some patience so I can start making bread-love the smell of bread baking!!!! Just get a bread maker, then it will make a loaf for you! Two thumbs up for bread-n-butter! Give it a try! Bread or dessert, it’s a toss up! Perfect for a chilly wintry day! I’m so scared to make rolls and bread because I’ll mess it up. It’s really a fear I need to get over because yours always look so good. Trial and error Hollie! You can do it! I made my first rolls just before Christmas..parmesan thyme from Cooking Light and they turned out so flippin’ fantastic! And it wasn’t hard at all…major win! 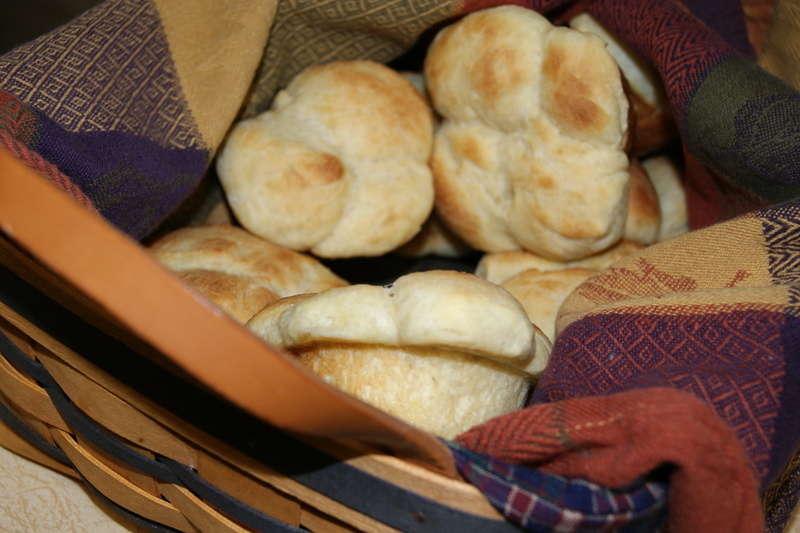 I used to love when my mom made homemade rolls and bread…. these look SO good. These look so good. There is nothing like homemade bread. I also love punching down the dough! It is fun isn’t it! Oh my gosh! Those look amazing! 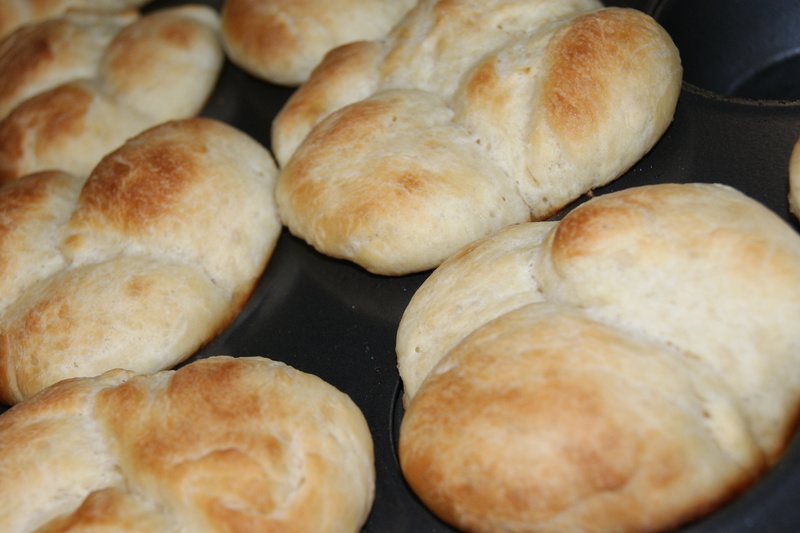 I love yeast rolls, but I’ve never made them myself due to my fear of baking with yeast! I am trying to get over it though…maybe trying these would help! Awe you can do it! oh YUMMY!! add a little honey to that butter and i’m in heaven! Now that’s a great idea Jill! I love honey too! Hey Sweets! I’ll be posting my olive oil rosemary foccaccia bread soon! These look incredible!! Thanks for another good one. Looking forward to that one Mindy! Oh wow, these look DELICIOUS! I love making my own rolls and am loving this idea of using the muffin tin! 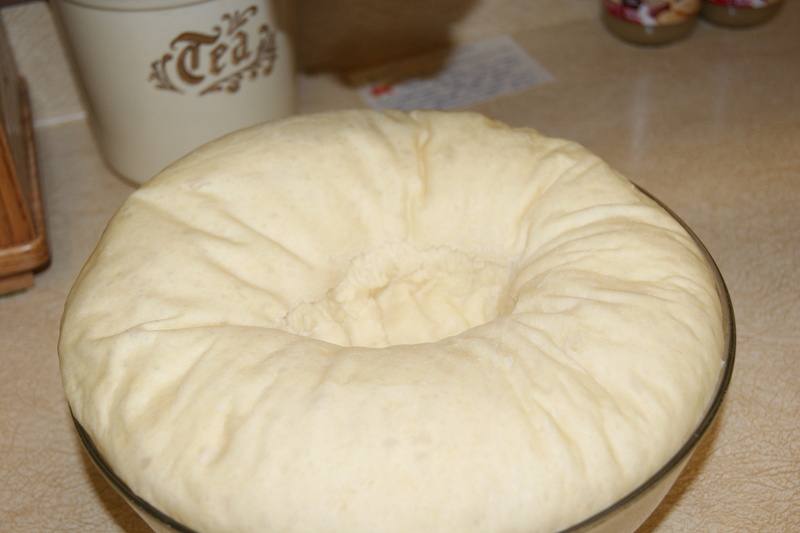 Never made myself some homemade dough but I may want to now just so I can punch it. haha just kidding. But that looks so good and toasty! Punching is the fun part! I’m terrified of yeast and baking bread but I have to say that you’re making me start my motivation! Mmmm! Those look awesome! I love how they are like little puff clouds! I hope you find a recipe to make for yourself soon. Can’t you alter them to be GF? They do indeed look incredible. I want bread so bad, this weekend, I think I’m going to make some bread. Hope yours is wonderful. Thanks for sharing this yummy recipe! I hope you have a bread-iful weekend Gina! I am sure they taste fantastic with butter and jam for breakfast! Yep!! I can smell them and they are making me swoon. I had to laugh about you liking to punch down the dough, my son has done that since he was little and even does it to this day! Love these! 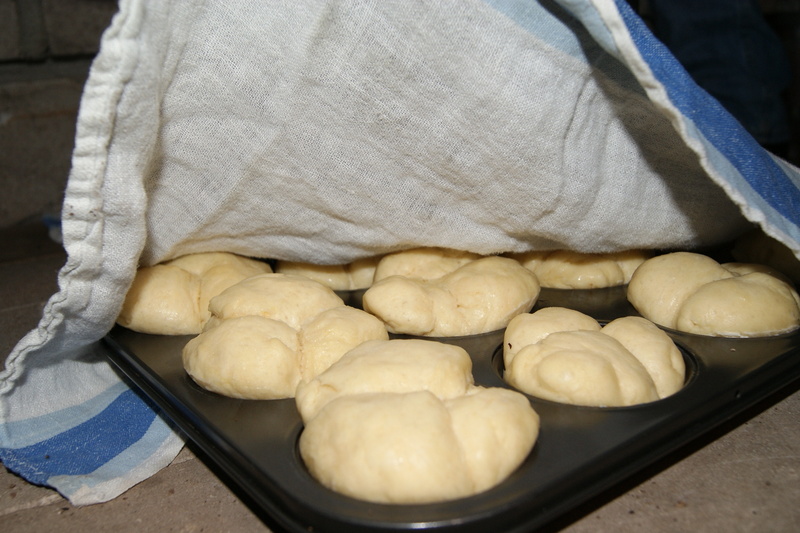 I have never made homemade rolls but I love your step by step instructions! They look great!! Thanks, it’s my mom’s recipe! punch that yeast girl! Love doing that. SO warm and gooey! The smell really is the best. I’ve never made my own rolls but I’ve always wanted to try. Your rolls look fantastic! I love your step by step photos. Bread is the one thing I have not yet made and am keen to do so really soon. Your yeast rolls do look pretty good. Thanks! Good luck with your bread making! I’m afraid to make bread at home since I could see it becoming an addiction. But you make it look so easy I would be stupid not to try it yes?! One of my coworkers has a recipe for the Red Lobster Cheesey Biscuits. That alone would be the end of me. Yes girl, I’ve made those cheddar bay biscuits from RL at home before. Easy and delicious! The best rolls I’ve ever made. Thanks for posting recipe!